Let’s now exit the house. 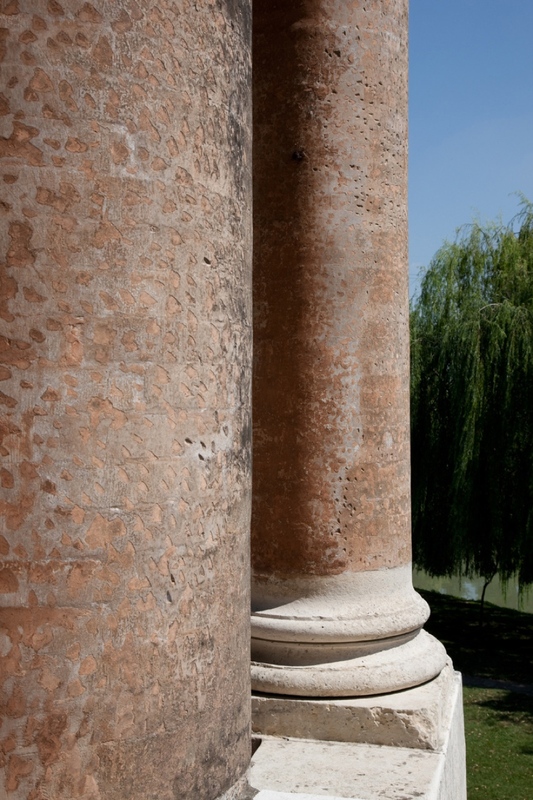 From the height of the porch, we see before us some of the garden’s designs made by Paul Rodocanachi in the 1920s – in addition to the Brenta Riviera whose waters flow slowly. In front of the house there is a semi-circular path; to our left is the so-called “rabbit island”, which is accessed by a small wooden bridge, and a little further along a dock where the gondolas arrived from Venice. Now we descend the stairs to go to the south part of the house. 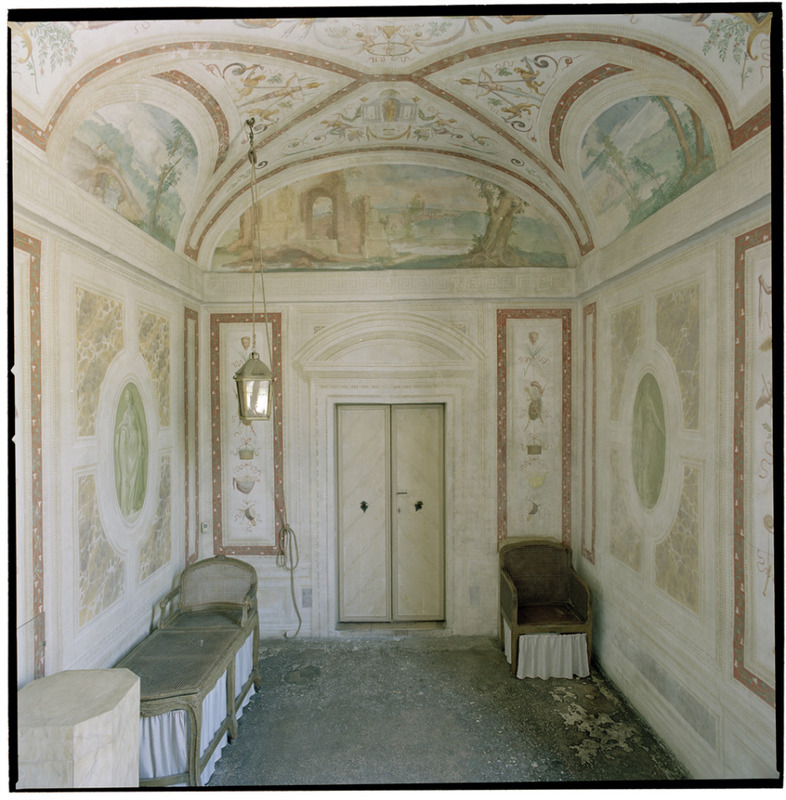 Walking alongside the villa, we find a small Italian garden languishing and evoking those “secret gardens” – so called in the sixteenth century- which are depicted in Palladio’s designs of this house that were eventually published in his architectural essay. The eastern garden is composed of low hedges where lavenders grow; the one on the west is designed by Paul Rodocanachi and as a sort of flowerbed maze. Once we reach the south of the house, we can admire its rear facade flooded with sunlight. 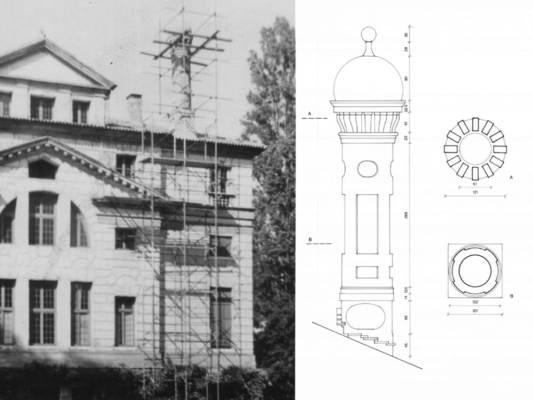 To acknowledge its peculiarity it is enough to say that in no other Palladian house is the rear facade of such architectural quality as to establish a compelling dialectical relationship with the main facade. This facade is dominated at its centre by a grand opening that has a dimension equal to the whole section of the central hall. The semi-circular window, which is most characteristic of the whole system, is called a thermal window because it is of the same type as the windows of the ancient Roman baths. As in the baths of ancient Rome, the arch of this unique window crosses the lower entablature of the frontispiece that is replicated on this facade of the porch. This is not the only notable detail of the composition of this facade. The representation of an ancient stone construction system is very cleverly done by engraving large occlusions in the thick marble plaster. 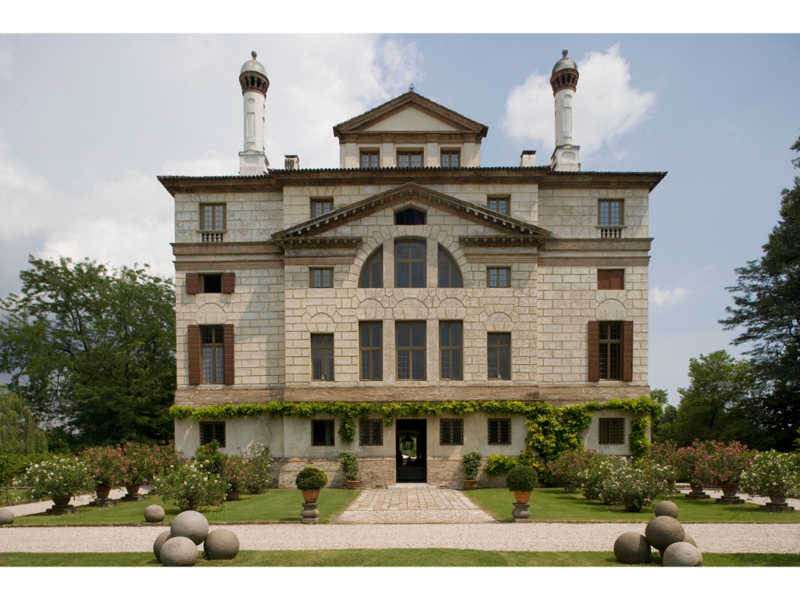 By thus comparing the whiteness of marble and the colour of the plaster, Palladio also achieves a chromatic effect that is one of the most distinctive and original features of this facade. 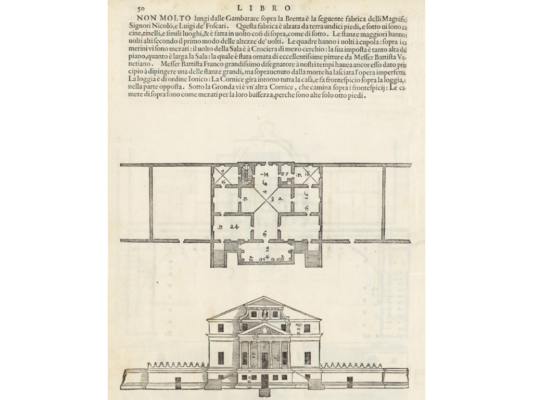 Theoretical choices of this kind are proof of Palladio’s commitment- building such an important house almost on the edge of the lagoon- he intends to show the quality of his architectural language to the Venetians, and above all to the leading classes while demonstrating the skills acquired through many years of work. (See for example how he composes in perfect balance a set of apertures that are so different from each other). Above the cornice that finishes at the top of this house, you can see – together with the garret – great chimneys that add a typically Venetian connotation to an artwork evoking Roman antiquity. As we continue our walk in the garden, following those paths created in the 1920s, I will tell you some fascinating stories about the history of this home. 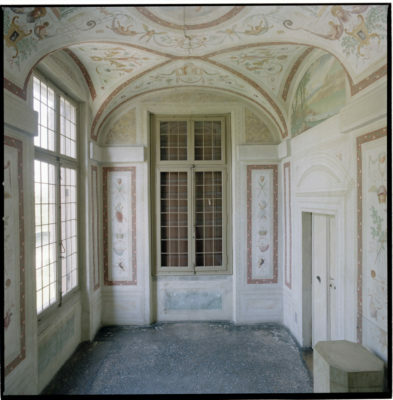 Historical events are also an essential element that enhance the charm of mansions of this fame. 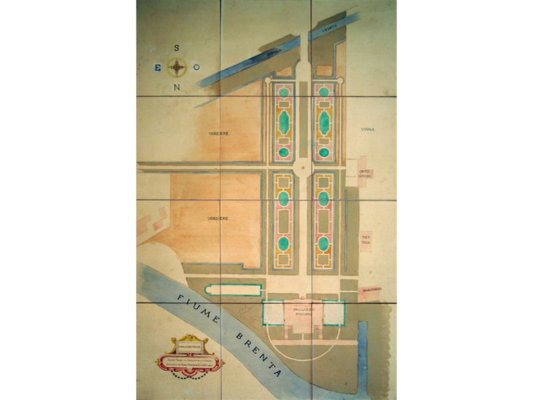 Il disegno mostra uno dei vari progetti per il giardino che Paul Rodocanachi realizzò negli anni del venti del novecento. 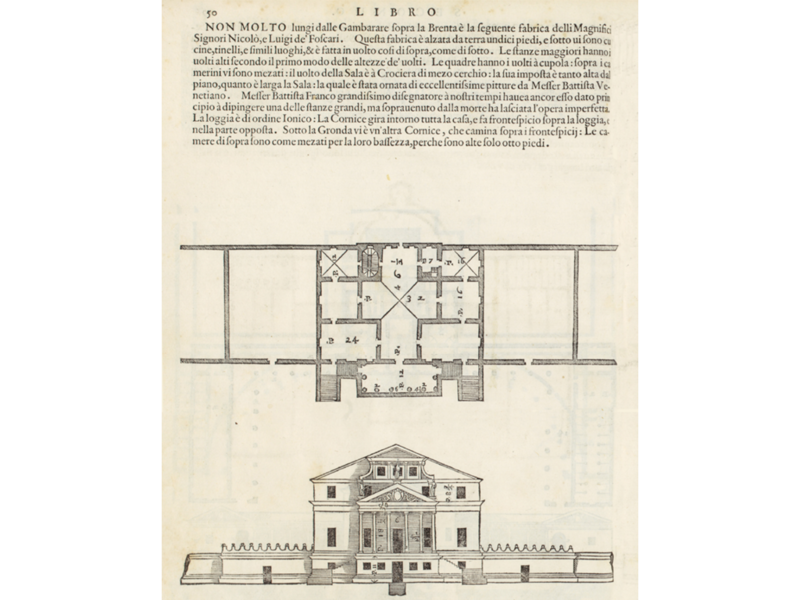 A. Palladio, I Quattro libri dell’Architettura, Libro II, p. 50. Si notino i due “giardini segreti” progettati e mai realizzati ai lati della casa. Facciata meridionale in cui si nota la finestra termale, la trabeazione interrotta e appare, anche qui, la bicromia data dall’uso del cotto per il basamento e per i cornicioni, in contrasto con la bianchezza del bugnato inciso sull’intonaco (foto: Sassi). Il restauro di uno dei camini della villa; a destra: il rilievo di questi camini, alti più di sei metri.